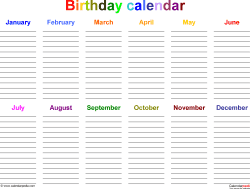 Do you sometimes forget friends' and family's birthdays? Rush round searching for a last minute gift because an important birthday or anniversary slipped your mind? 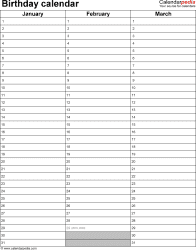 Well, these practical and versatile birthday planners are the answer! 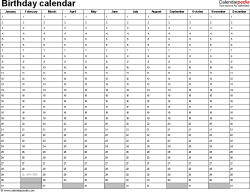 Never forget another birthday with these annual, perpetual birthday calendars (undated) in PDF format. 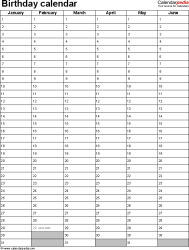 Available in a variety of layouts to download and print out free of charge. 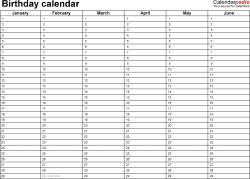 Keep a copy on your desk or in your diary, pin one to the wall or stick one on the fridge! 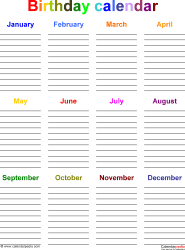 From colorful fun versions to professional-looking ones, these birthday lists feature the months of the year only, giving you the flexibility to enter names and dates for specific birthdays. 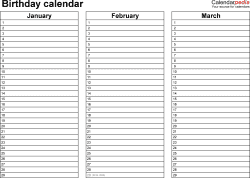 The year is not specified, so your birthday calendar will never go out-of-date. Perfect for recording the birthdays of family and friends, work colleagues, organization, group or school friends and classmates.